Another year of school for kids, and for some it’s the start of a new chapter of their life called ‘work’. We all had to take classes in subjects that didn’t apply to what we’d do in the future. Worse we had to pass, so we could graduate. So we studied, and I’m sure you urge your kids to study and do their homework on those courses, too. 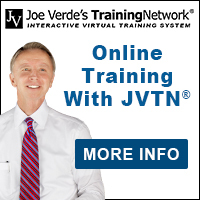 Now you’ve chosen to be in a profession that offers the opportunity to realistically earn $100,000-$300,000+ every year. That’s heads above what 95% of the population will ever earn. How many of you got 100 times more education in a subject you’ll never use, than you’ve given yourself in this profession? You just need to develop core skills, come to work to work with a great attitude every day – and you can earn an incredible income that can change you and your family’s lives forever. Even if you don’t want to learn more and earn more – double check with your family, just in case. Let them know you honestly could earn a lot more and ask for their opinion. 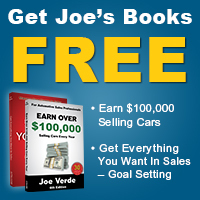 Get Joe Verde’s sales book, Get Everything You Want In Sales, now and put your career on the right track.